Roof leaks are more than a nuisance in Denver Colorado – they are a problem. If left unchecked, even a small leak can cause considerable damage to a home. Beginning with simple cosmetic problems such as wet spots on the ceilings. Water infiltration can cause problems with drywall damage, wet carpets, or even damaged furniture and treasured family photos. In some instances a roof cheap cytotec online leak in Denver can cause severe damage to your most valued asset, your home and make it very hard to resell if that is your wish. Not even the dry climate areas of Denver Colorado are spared of the damage associated with leaky roofs. A single summer time rainstorm, or a heavy winter snowstorm can cause you problems. If there is a problem, call a trusted local roofing contractor in the Denver Boulder corridor that understands leaking roofs. Call Campbell Beard Roofing. Every year in Denver roof leaks cause thousands of dollars of damage to our homes. Yet people fail to understand the importance of having your roof properly maintained by a trusted, quality, roofing contractor that understands how to determine what is causing the roof to leak and more importantly how to fix a leaking roof. This simple task performed by Campbell Beard Roofing of finding and fixing a leak in your roof will ensure that you have the peace of mind to enjoy your home leak free. Denver roof leaks are difficult for inexperienced people to diagnose, so the best course of action when you suspect that you have roof leaks in Denver is to contact a specialist from Campbell Beard Roofing, a trusted local roofing contractor. Some of the typical signs of a roof leak problem that may require a Denver Boulder roof leak repair are wet spots on ceilings, standing water in your attic spaces, wet insulation in your attic or wall spaces and possibly the appearance of mold. As soon as you encounter any of these problems you should call one of Denver’s most trusted roofing companies specializing in leaky roof repairs, Campbell Beard Roofing. You should keep in mind that water infiltration does not always appear where the roof leak is located. Water can travel laterally through the different sections of the roof structure and show up in a completely different part of the home. This means that in Denver Colorado a wet spot on the drywall can show up several feet from where the leak is actually occurring. The trusted employees of Campbell Beard Roofing will accurately determine the position of the roof leak and they will take the appropriate actions to ensure that the roof leak is fixed to your satisfaction. Roof leaks in the homes of the Denver Boulder Colorado corridor should be prevented as much as possible, prevention thru maintenance of a roof in the Denver area is always the preferred method versus the interior damage repair or possible reroof that might be need if attention to a roof leak in Denver Colorado is ignored. 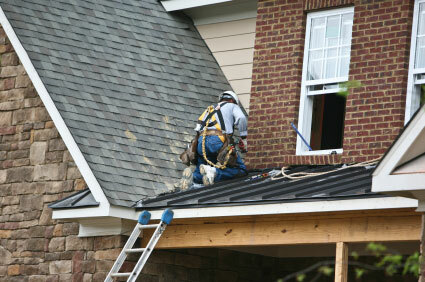 When you call to enlist the services of a roofing contractor in Denver to help you with a roof leak problem, they should also pay attention to other elements of the roof such as the pipe jacks flashings and the HVAC caps and collars, they should also look at the kick outs to see if water from the roof is being properly diverted to the gutter on the home. Trust in Campbell Beard Roofing to ensure your Peace Of Mind.